During work breaks (when I can take one) I like to play a game or two of solitaire on my Siemens SX66 PDA Phone. Lately I've been playing FreeCell (thanks to FreeCell for Pocket PC by nandhp). I had gotten to the point that I could win every game (with a few undoes). I began to wonder if there was a solution to every game. 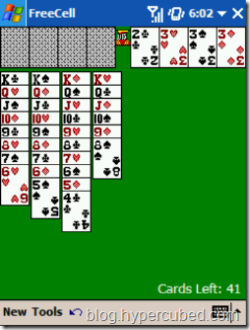 Turns out FreeCell is one of the most popular solitaire games because it has the one of the highest win rates of any solitaire (see FreeCell -- Frequently Asked Questions (FAQ) written by Michael Keller). There are some deals that are unsolvable. With this knowledge my game playing strategy changed. I no longer wanted to simply play free cell but actually solve every single game I was presented with. Needless to say this often takes many undoes or a restart. Up to the other day I had solved every one presented to me (about 35 games). Well, I finally hit one that I couldn't solve.... unfortunately it had nothing to do with the deal. The game simply cheated. Take a close look at this screenshot.